Have you ever tasted baijiu (prounced bye-jyo)? Nevermind. Have you ever heard of it? Probably not. Neither had I, until recently. It’s a Chinese spirit –the world’s best-selling alcohol by volume, outselling whiskey and vodka combined – that some non-Chinese may find challenging. A white spirit with a savory funkiness, it stands apart from other spirits, and to say that it’s an acquired taste is an understatement. Some might liken it to firewater. Indeed, some brands exceed 100 proof, but not all. Others refer to it as the stinky tofu of the liquor world. This is closer to the truth. Nevertheless, I celebrated the Chinese New Year at my favorite restaurant, The Orient, in Bethpage, NY, with this traditional Chinese tipple, after sampling several baijiu recently at Post Wines in Syosset, NY, guided by Bill Isler, director for North America of Ming River, a new brand that arrived stateside just months ago. Baijiu, which translates to “white alcohol” in Mandarin Chinese, Isler told me, is usually made from sorghum, a common animal feed, but can also be made from other grains. Its ingredients and style vary by distillery and region, but generally are divided into four flavor classifications: strong aroma (full bodied, spicy, fruity), light aroma (light, floral, slightly sweet), sauce aroma (umami, mushroom, earth) and rice aroma (light, clean, honeyed). 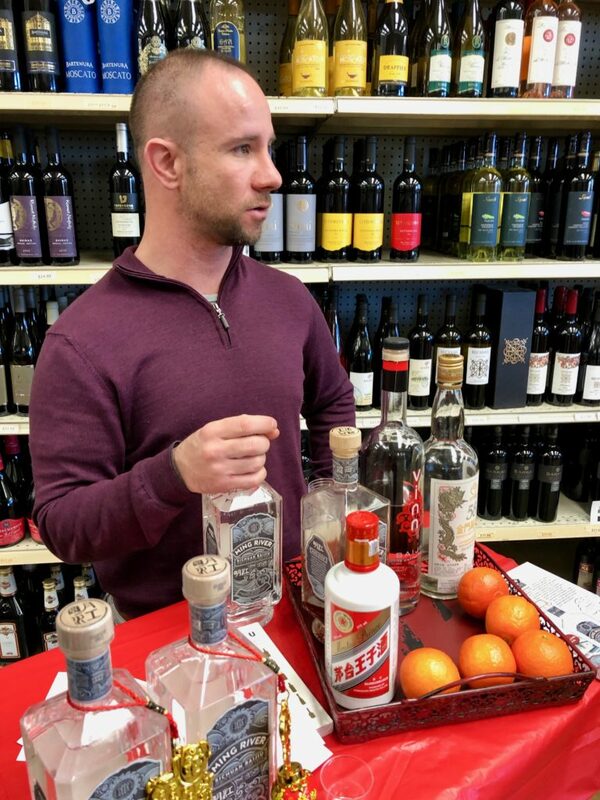 Isler and his partners hope to create new spirits category in the U.S. To be sure, other baijiu are sold in the U.S., mostly in Chinatowns. One, Vinn, is made in Oregon using brown rice from California. Isler’s product, Ming River, is a strong aroma baijiu, though the label identifies it as Sichuan style. It’s made by a distillery that’s been producing baijiu since 1573. Made from red sorghum and fermented the traditional way – in clay pots with locally harvested yeasts that are buried for two weeks in pit – the result is a 90-proof spirit. My second taste was a baijiu classified as a light aroma, Kinmen Kaoliang, from Taiwan. At 116 proof it’s got a kick that made me wince upon my first sip. It’s a bit like a grappa and somewhat reminiscent of Rhum Agricole from Martinique. It has a grassy, herbal character. Next up was Isler’s brand, Ming River, classified as a strong aroma baijiu. It offers up bright, fresh tropical fruit notes along with some licorice-like star anise and a sweet funkiness. My guess, it’s been designed to appeal to western palates. The final baijiu in the flight was Kweichow Moutai Prince, from China’s largest distillery, categorized as a sauce-aroma baijiu. It’s 106 proof and has big-time funky notes of stinky cheese and mushrooms. It finishes surprisingly sweet. Isler’s Ming River brand is an outgrowth of a successful bar, called Capital Spirits, that he and ex-pat partners started in Beijing that was dedicated to single shots of baiojiu,. Isler, for one, who majored in Asian studies at Columbia University before spending decades in China, calls himself a serial entrepreneur. Ming River Baijiu, made at the state-owned Luzhou Laojiao, China’s oldest continually operated baijiu distillery, starts with a mash of locally harvested red sorghum grain and local well water. It is fermented in 30-year-old earthen vessels with naturally harvested yeast cultures native to the Sichuan river town of Luzhou. After two months, the mash is unearthed and distilled in small batches using a traditional Chinese pot still. The spirits then are aged for up to two yearsbefore blending into Ming River’s distinctive flavor. Baijiu is traditionally enjoyed neat at room temperature, but Isler is working with bar tenders in trendy eateries to develop cocktails based on the spirit. He likens Ming River to Rhum Agricole, the white rums made from sugar cane in the Caribbean that are often components of cocktails. A 750ml bottle of Ming River retails for $34-$35 with distribution currently limited to New York, Los Angeles and San Francisco. In New York, you can find it at Bottle Rocket in Manhattan, in Brooklyn at the Brooklyn Wine Exchange andat Post Wines. Park Street Imports LLC, of Miami, FL, is the importer. I purchased a bottle of Ming River and brought it to dinner. Most of my companions were not enthusiastic. I enjoyed it, however, sipping numerous cups as we dined on some 11 courses of Cantonese fare. Gan-bei! It was an unusual dining experience the other evening at Le Fond, the Michelin Guide-listed French bistro in Greenpoint, Brooklyn, to say the least. How odd is it to sip Italian wine in a French restaurant, in Greenpoint? Le Fond a tiny place with oak tables and simply decor and except for our party of 15 it was largely empty on a Wednesday evening. I was there as a guest of Fattoria Betti, a Tuscan wine producer seeking an importer and looking to impress the media. (The guests were bloggers, mostly interested in culture, not wine). The eatery was selected by the winery’s Italian PR firm and our menu had been scripted almost three months in advance. To be sure, the wines, except for a Sangiovese-based rose served with dessert, paired nicely with our food, though I was not exactly enamored by my host’s dining choices. Our host was Guido Betti, owner of Fattoria Betti, a 500,000-bottle-a year winery in the Montalbano region of Tuscany, Italy, Betti has 26 hectares of red clay vineyard and sells half of its production to private label customers and outsiders. Last year’s production was impacted by lousy spring weather. Fattoria Betti’s wines are fermented in steel and concrete vats, the IGT wines aged a year in 900-liter tonneau. Fattoria Betti exports 60 percent of its production throughout Europe and China, but not the U.S> Betti is hoping to find a U.S. importer. “it;s the most important market in the world,” he told me. The restaurant is known for its French comfort food and that, indeed, is what we had, prepared expertly by chef owner Jake Eberle, a Cordon Bleu alum. 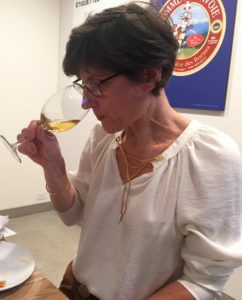 We started with 2017 Creto de Betti, an easy sipping, fruity, white blend of Chardonnay and Trebbiano, which was paired with Spring Vegetable Capriccio with mustard vinaigarette and egg. Pretty as a picture, the dish consisted of razor thin shavings of tomato, beets and zucchini showered with milled hardboiled egg. There was, sadly, not much to taste beyond the dressing, although the crusty dark bread and sweet, creamy butter helped fill things out. Our second course, cavatelli with prosciutto, scallions, green lentils in a spinach emulsion (foam), was a delight. The pasta perfectly al dente and the sauce stood up to the winery’s high alcohol (14%), fruity, but earthy 2016 Chianti Montalbano, which had just the right acidity to offset the rich dish. Our main, was braised lamb shoulder with artichoke barigoule (the vegetable was stewed in wine), all topped by a minted salsa verde. The lamb was tender, but lacked verve, despite the minty salsa. The wine with this course, 2016 Prunideo, was a blend of Sangiovese and Cabernet Sauvignon. 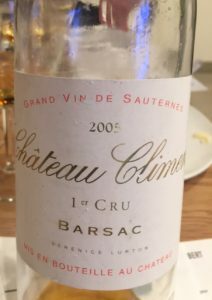 It was inky, more elegant and more powerful than the Chianti, but still easy to drink and it out-showed the food on my plate. The chef, however, shined with dessert, Chocolate Cremeux (custard) with poached strawberries and a dab of vanilla custard. It resembled a long finger of chocolate truffle, but was soft and creamy and it melted instantly inside my mouth. Alas, the winery’s 2017 Caprone rose, a pretty deep pink, was disappointingly blah. A recent visit to South Florida provided an opportunity for two days of boozy adventures, visiting some old haunts and a couple of newer breweries. I was delighted by several beers and, surprisingly, disappointed by others, especially the offerings at one of the region’s leading beer makers. Among the delights I found were the handful of brews sampled at Bangin’ Banjo Brewery, which is located in an industrial park not far from the highly popular Festival Flea Market in Pompano Beach. Bangin’ Banjo is a 3-barrel brewing operation opened in mid-2014 by a pair of homebrewing friends. Nothing fancy here. The tasting room, rustic in tones of green and varnished pine, puts the focus on the beer. And they were quite satisfactory. High on my list were Swiftness Potion Belgian Triple, a deep-golden brew with an intense Belgian yeast character, banana notes and a dry finish; OJ Session IPA, an eminently drinkable crisp, light golden brew with a citrus nose with notes of sweet malt and piney hops; Annie’s Raspberry Cream Ale, a light, cloudy brew redolent of the red berries; Bangarang English Brown Ale, a copper-hued, somewhat grainy brew with notes of chocolate and nuts; and Overcast Shadow, a chewy, winey, deep-brown Russian imperial stout with a mocha head and notes of chocolate and licorice. 26th Degree Brewing Co., launched in September 2015 by a group of self-taught homebrewing buddies, occupies a former supermarket on a busy main strip in Pompano Beach that’s close to the Atlantic Boulevard bridge that spans the Intracoastal Waterway. The brewery’s name is derived from the city’s latitude. It’s brewing system, behind the large taproom, turns out 30 barrels at a time. It was easy to feel lost in the sprawling 4,500-square-foot, industrial-chic taproom on an early Sunday afternoon. The beers, served way-too-cold, were largely uninspiring. Erick the Great, an opaque black Russian imperial stout made with Belgian yeast, however, stood out with it a rich chocolate velvety character, estery Belgian notes and a dry finish. After several visits here in recent months, I’ve learned it’s best to stick to the tried-and-true year-round brews and avoid the overly sweet, flavored beers no matter how tempting it may be to give some of these brews with outlandish flavor additions that include strawberry extract, vanilla, chocolate nibs and more (Last Snow is an exception). The tasting room and outdoor drinking areas always seem to be filled. During my most recent visit, a pug dog-rescue group was holding a fundraiser and a bunch of people masquerading as Star Wars characters abounded. Last Snow, unfortunately was a week away from being released when I visited. One standout among the specials was the Veruca Snozzberry Gose, a Berliner Weise brewed with kettle salt and coriander with a name that references the spoiled bratty girl in “Willy Wonka.” A refreshing brew, it’s a bright orange yellow and its taste suggests orange juice with salt. Avoid Hit “Em with Hein, a creamy sweet brew with a fake strawberry flavor reminiscent of the taffy I ate as a kid; What is That Velvet, a flavor-muddled copper brew and Neapolitan Porter, a sweet brown brew with vanilla notes rising above the other muddled flavors; and, I’m So Excited, I’m So Scared, which tasted of sweet roasted grain and little else. My third visit to this out-of-the-way, but pub-style tasting room, was less inspiring than earlier visits, though Jess, who worked the behind the bar, was a helpful guide. Nuance, a prototypical Saison, was a top quaff, and Monk Be Mine, a cherry chocolate quad brewed for Valentine’s Day, wasn’t far behind with a full-bodied velvety character and the suggestion of chocolate-covered cherries. Other offerings I tried were less successful, including 1801, a brew redolent of coffee and little more, and Start Sour, a fruity brew with only the barest suggestion of tartness. I first visited here on the eve of its opening three years ago. Head brewers have come—and gone, but the basic beers remain the same. Since then, they’ve turned out more than 300 different brews, many twists on the core roster. Alas, an old favorite, Don’t Get Confused, a Belgian tripel was not available. On this visit, I particularly enjoyed Mayday, a deep-brown, malty, drinkable American porter. Monk’s Vacation was an interesting quaff reminiscent of a sweet spice cake, albeit a liquid one, with dominant Belgian yeast and clove flavors. We ran into Jess, who served us at Barrel of Monks a day earlier, behind the bar here. She knows her way around beers. Named for an indie rock song, the brewery was opened in mid-2015 by Chip Breighner, who worked at a home beer supply store. He brews on a 1-barrel system so that qualifies Devour as a nano. Our evening visit was interrupted by a power outage, forcing us to drink at one of the tables set up in the parking lot that serves the industrial strip that is the brewery’s home. I enjoyed the SoBo Wit, cloudy yellow, lively and a definite orange character, but was unmoved by most of the others brews sampled. My second visit since its opening in the spring of 2016. Owner Matt Cox, winner of GABF gold medal in 2002 when he worked at Big Bear Brewing in Coral Springs, brews on a 20-barrel DME systems, viewable through the wall of the comfy brick-walled taproom. Das Pilsner, a bright golden, crisp brew with notes of fresh hay, was an enjoyable quaff. Also quite tasty, Blood Orange Wit with its reddish hue, citric-cardamom nose and the notes of sweet fruit and spices that played off against one another.